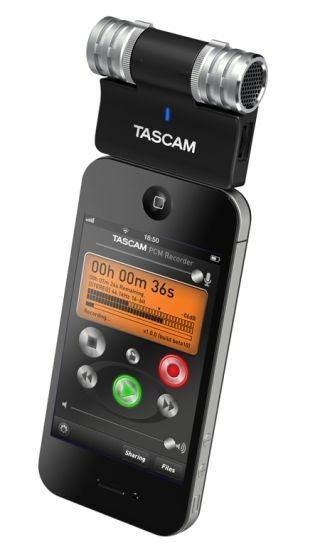 Tascam iM2 turns Apple iPhone or iPad into high-quality stereo recorder | What Hi-Fi? Professional recording specialist, Tascam, has launched a pocket-sized stereo microphone and accompanying app that turns the Apple iPad/iPhone/iPod Touch into a high-quality stereo recorder. The iM2 features a pair of 180-degree adjustable condensor microphones - the same quality as those in Tascam's popular DR-series recorders. It plugs directly into the dock connector of your Apple device. The iM2 also has its own microphone preamp and analogue-to-digital converter. Unlike some rival iPhone mics that use the Apple's own pre-amp, this means the Tascam can handle up to 125dB SPL sounds for the loudest concerts and instruments. While on the subject of volume, the iM2 has a stereo limiter to tame sudden, loud sounds. The mic level is designed to be quick and easy to adjust without looking at the unit. The battery-free iM2 is powered through the dock connector, with a USB socket provided to charge your Apple device for long recordings. The ideal partner for the iM2 is Tascam's new PCM Recorder app, available for free download from the Apple iTunes store. The app offers input and and output level faders, with an on-screen level meter. High and low EQ is built-in, as well as stereo limiting and a low cut filter to prevent overload. Users are able to record mono or stereo files at CD-quality for up to 12 hours. After recording, files can be accessed through iTunes or uploaded to SoundCloud directly from the iPhone. The Tascam iM2 is available this month, priced £85. The free PCM Recorder app is avaialble now.